The city of Vlissingen (in English: Flushing) is situated in the southwestern Netherlands on the former island of Walcheren in the province of Zeeland (Sealand). With its strategic location between the Scheldt river and the North Sea, Vlissingen has been an important harbour for centuries. It was granted city rights in 1315. 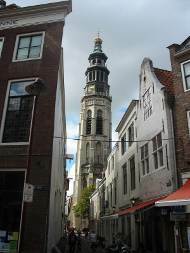 The city of Middelburg is the capital of the province of Zeeland and is situated in the south-western Netherlands. Middelburg has a population of about 48,000.